New Delhi: Seeking to take advantage of the buoyant stock market, the government approved the sale of stakes in two state-owned undertakings— NTPC Ltd and Satluj Jal Vidyut Nigam Ltd.
Alongside this, the cabinet committee on economic affairs (CCEA) also approved a radical revamp of the Wholesale Price Index (WPI), the most commonly used measure of inflation, that entails an update of the base year and a change in the frequency of the data release. CCEA approved the disinvestment of 5% of paid-up equity capital of NTPC, in which the Union government owns 89.5% of shares, with the rest being held by the public. 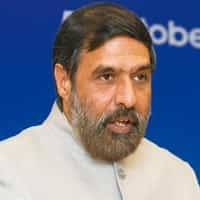 “This will help the public at large to participate in the ownership process of public sector undertakings such as NTPC Ltd," said Anand Sharma, minister of commerce and industry, while addressing the media. “The divestment is in line with the statement given by the President (Pratibha Patil)" in the joint session of Parliament in June. The key index of the Bombay Stock Exchange (BSE), the Sensex, has gained almost 80% this year on inflows of foreign funds and expectations that economic growth will accelerate. NTPC, India’s largest power generation company, is valued at around Rs1.7 trillion and registered a net profit of Rs7,827.40 crore on revenue of Rs42,182.40 crore in 2008-09. The company has reserves of Rs53,000 crore, and a senior executive at NTPC who did not want to be identified also agreed that the government could expect to raise around Rs8,600 crore with a 5% dilution. R.S. Sharma, chairman and managing director of NTPC, said he expects the stake sale to take place in February. “We are meeting all preparations and shall be ready," Sharma said. “The entire proceeds will go to the government. With liquidity increasing in the market, it will help in the pricing of NTPC’s shares." The disinvestment is expected to raise NTPC’s market value, the government said in a release. 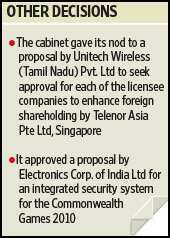 This will “help the company to raise resources in the international market on competitive terms". The cabinet approved the sale of 10% of the Union government’s stake in Satluj Jal. The Union government holds 75% and the Himachal Pradesh government 25% of the company that works in the area of planning and executing power projects. The NTPC share sale will be an opportunity to invest at a price lower than the market rate, said Prithvi Haldea, chairman and managing director of Prime Database. “NTPC has already demonstrated that it is a blue-chip company and a leader in the thermal power generation. Its stock has also tripled," Haldea said. “An FPO (follow-on public offer) is a no-brainer as everything has already been discovered." Shares of NTPC fell 0.35% on BSE to close at Rs213.90 last week. The Sensex, the equity benchmark index, rose 0.02%. The exchange was closed for a public holiday on Monday. The cabinet also approved a change in the base year of WPI from 1993-94 to 2004-05. Besides this, the department of industrial policy and promotion, the government body that releases WPI, will change the periodicity of the release to once in a month instead of once a week now. Inflation data is released at noon every Thursday. However, primary articles and commodities belonging to the fuel, power, light and lubricant group will continue to be compiled on a weekly basis. Price data for manufactured products will have a monthly frequency. As agricultural commodities and petroleum products are sensitive by nature, a weekly monitoring of the two categories will be better, according to the government’s press statement. Chief statistician Pronab Sen said a change to 2004 as base year is a good step as it is representative of a better and changed gross domestic product scenario against what was being reflected by data pertaining to 1993-94. Sen also said the complete WPI will now be released on a monthly basis, both for manufactured and primary products, and a separate index will be compiled for primary products on a weekly basis. Of the 435 products in the index at present, 318 are manufactured products, 98 are primary articles such as foodgrains and oil seeds, and 19 are fuel group items. The new frequency and changed base period are both based on recommendations submitted in May 2008 by a working group headed by economist Abhijit Sen, a member of India’s apex planning body, the Planning Commission. “We cannot decide on the exact number of items to be included in the new series before the flow of price data stabilizes," Sen said. “The new series has to wait until next year." The key recommendations were a monthly release of inflation data, inclusion of more products and a change in the base year from 1993-94 to 2004-05, thereby making the data more representative. While the group had suggested increasing the number of products covered to 1,224, Sharma said there was no expansion in the basket of products. He added that the change has been incorporated based on the recommendations made by the group and it will be implemented soon, though he did not give a time frame. Utpal Bhaskar and Asit Ranjan Mishra contributed to this story.